If you saw my appliances in the new house, you would cry. I can handle ugly. I can handle outdated. But honestly, I’ve never seen a kitchen like this before in my life. We’ve reached a whole new level of vintage, it’s called ancient. There was actually a moment in time where I contemplated contacting the manufacturer, hoping that perhaps they would send me something new and shiny out of sympathy. But that idea came and went. I just know, that the minute I go to cook something it’s going to be a complete disaster. My oven door is held up by a hook, OK?! Maybe I will show you a pic (I’m still in denial). Since we have a couple days before moving in, I decided to prep a bunch of meals to take over. This is one of them. The idea is to just reheat and serve, hassle free. If my prediction comes true and our stove bursts into flames, at least I was prepared! Better to be well fed than stuck with greasy takeout. Now, this is what I want to eat after painting a house! I use organic boneless, skinless chicken thighs for this recipe because they stay moist when baked. You can substitute with chicken breast as well (just keep an eye on it so it doesn’t overcook). You will need a large, ovenproof casserole dish. Mine was a 9-inch, 2 quart, oval shaped dish. Everything fit perfectly. I like to buy marinated artichokes hearts from my Italian deli. You can also find them in most grocery stores. For the chicken marinade, drain the artichoke hearts reserving the juice. To a large bowl, add the chicken, artichoke juice, garlic, and oregano leaves. Drizzle with olive oil, a splash of red wine vinegar, and mix well to coat. Marinate for at least 1 hour, maximum 3 hours. To a casserole dish, add the sliced onions and tomatoes. Toss with olive oil, salt and pepper. Cook, stirring occasionally, until the onions are soft and the tomatoes begin to burst, about 15-20 minutes. Meanwhile, in a large skillet warm 1 tsp. of olive oil over moderate heat. Remove the chicken from the marinade, pat dry, and season with salt and pepper. Working in batches, brown the chicken on both sides. It will be slightly undercooked. Remove the casserole dish from the oven. Add the cooked pasta, chicken, artichoke hearts, beans, olives, and chopped herbs. Stir to combine. Top with grated cheese and bake for an additional 5-7 minutes until the cheese is brown and bubbling. If you like it really brown, pop it under the broiler for a minute. Remove from the oven and garnish with fresh herbs right before serving. I adore your original recipe, Emilie and have made it several times, so can’t wait to try this one! Love the pasta! My my my this looks absolutely fantastic!! I am seriously in love! May try this with rice vs pasta! Hi Christen! That’s an excellent idea. Rice, quinoa, and cracked wheat are all excellent substitutions. I’ve even made it with orzo and couscous as well. It’s a very flexible recipe to make your own. I hope you enjoy and thanks for stopping by! I love a good pasta bake, this looks so tasty and nourishing – just what you need during a move! I cannot wait to make this, maybe this week! It looks too good to wait for!! Thank you for sharing this lovely recipe! 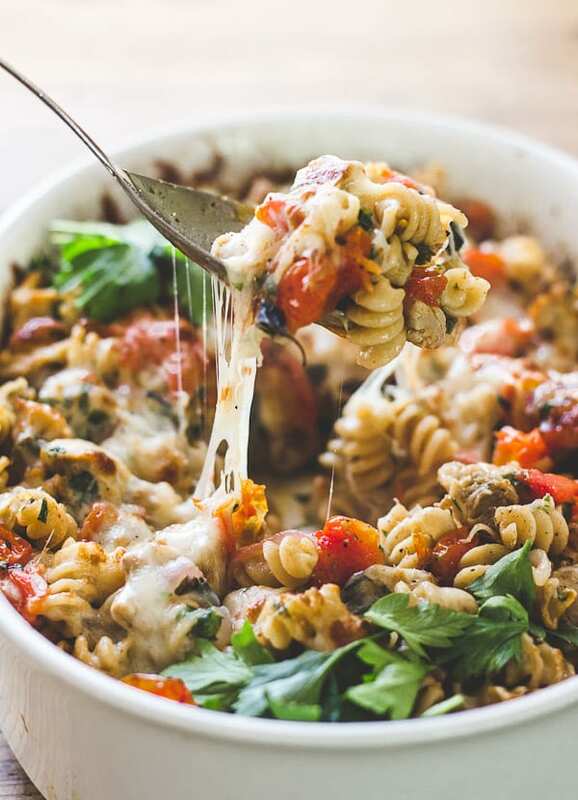 This pasta bake looks totally incredible. Love it. This recipe sounds amazing and your pictures look wonderful! 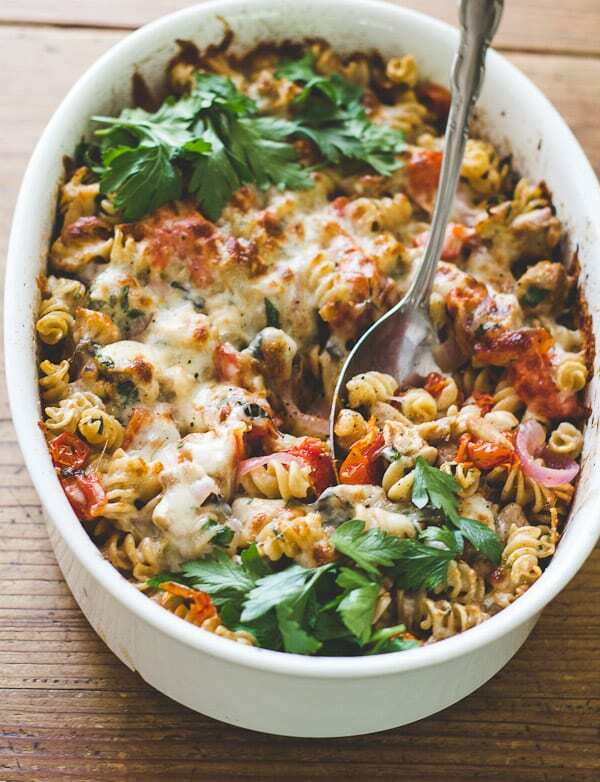 I’m lactose intolerant so I couldn’t use mozzarella with this recipe but I could substitute with feta or goat’s cheese. Have you tried baking with either? hmmm. I was all set to make Pad Thai for dinner, but this is now tempting me. Might have to make it on the weekend. For those of you who made this recipe as written, about how many serving did it make (about one cup per serving)? It says it serves 4, but I’m using this recipe for a class cooking project, and when I tried calculating the yield, I got a little over 15 servings. Thanks! This recipe is intended to feed 4 (hungry) people for dinner. It’s not measured as 1 cup per serving. That’s probably why your calculations yielded 15 servings. I hope this helps! What’s worse than “ancient” appliances? No appliances at all or appliances that don’t work and you can’t afford to fix or replace them. I tried to pin a few recipes of yours but Pinterest said they may lead to Spam. Any idea how to fix this? I don’t get spam when I come to your site. Very frustrating. Hi I am so excited to make this! But what is the artichoke marinade? The stuff I threat from pickled artichoke hearts? Great! The recipe calls for marinated artichoke hearts, so the marinade in the recipe is the ‘juice’ in the jar. Hope this helps! Enjoy! I’ve never cooked with artichoke before, so I’m very unfamiliar with what your using as a marinade. How are you doing this? Can you explain the process of this sentence? For this recipe, I use marinated artichoke hearts which usually contain garlic, vinegar and spices. They come in a jar. For the instructions, just drain the artichoke hearts reserving the marinade or ‘juice’ that it comes in, to then create the marinade for the chicken. Hope that makes sense!